Fortune (the Wheel of Fortune in the Rider-Waite tradition) corresponds to the Hebrew letter Kaph, representing the ability to realize and actualize potential, and the powerful forces that can help. Its original pictographic meaning was that of a palm, or what could be contained in a palm. The palm represents holding something, and sometimes caring for it, and helping it to actualize its potential. The palm of the letter Kaph is the palm of God’s hand, which holds all of the potential in the universe, and allows anyone to become anything. And what else is the potential of everything, and the divine guidance of God but Fortune? This card represents the inscrutable will of God, which appears to mortals who cannot comprehend it in its entirety as the whims of Fortune. This card symbolizes powerful, inexorable forces beyond the control of any one person; the powers of war, love, death, change, catastrophe, and blessing. Fortune takes the form of a wheel in both the Thoth and Rider-Waite, each one with eight spokes or divided into eight parts. Three animals surround each wheel, representing the three major alchemical elements (salt, mercury, and sulfur), and therefore completion. The Thoth art also shows a triangle in the background, with spirals coming out of its center, indicating power and infinity – the infinite power of God’s will. The wheel turns, and different parts of it rise to the top – different spokes and different animals. 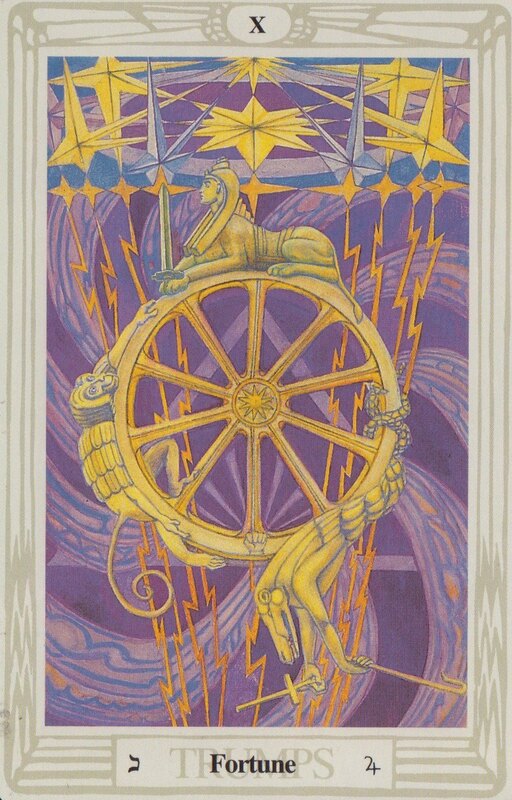 The wheel represents what mortals see of Fortune, and it is an apt metaphor, for the wheel is always turning. This card, then, symbolizes reversals of fortune, vast, sudden change, and the cycles of creation and destruction. Astrologically, this card is associated with Jupiter; ruler of the Gods, the bringer of fortune and abundance, and the quest for knowledge and truth. He expands outwards in all directions, encompassing everything; his will is the will of God, and it is Jupiter’s whims that bring good fortune to others. This card represents chance, luck, and also unity and the universe, as well as power. As the wheel turns, so it represents also fluidity, motion, and the unity that comes with motion. On the Tree of Life, this card is seen as the path between Chesed (Stability) and Netzach (Bliss/Degenerate Weakness), representing this card’s role as the bringer of chance, disrupting stability by inserting weakness. The card’s astrological equivalent, Jupiter, also can represent the idea of having too much; the definition in many ways of degenerativity and excess (like that of Netzach). In a reading, this card asks you to examine the roles of powerful, inexorable forces in your life, as well as sudden, unexpected change and the reality of chance and fortune. It asks you to remember that things are always changing, and reminds you of the unity of everything in existence. Reversed, this card’s energies are hidden or twisted somehow; it is important to keep in mind that reversed, this card does not mean misfortune; this card is completely neutral. So then, reversed, this card indicates exorable forces and minor examples of chance, and could also indicate weighted chances or unity being blocked. What divides you for others? What separates you from the rest of existence? This entry was posted on June 21, 2011 by Z. M. Wilmot. It was filed under Tarot .